Cut down on tobacco use - Smoking has been linked to various types of cancers (lung, bladder, cervix, and kidney). Even if you don't use tobacco, exposure to second-hand smoke may increase your risk of lung cancer. This is also an important part of cancer prevention. Eat a nutritious diet - A well balanced diet is advantageous for many reasons. A diet rich in fruits and vegetables, spices, nuts (a source of antioxidants), vitamins, and minerals greatly reduces the risk of developing cancer and many other conditions. Limit red meat and animal fat intake - Numerous studies show that a diet high in animal fat increases the risk for several types of cancer, particularly colon cancer. So, opt for lean cuts of meat, and choose poultry and fish instead. Include physical activity in your daily routine - Maintaining a healthy weight may lower the risk of various types of cancer like that of the breast, prostate, lung, colon, and kidneys. Include a minimum of 30 minutes of physical activity in your daily routine. You are never too old to start your work out. Reduce alcohol intake - If you drink at all, moderation is key. Excessive amounts of alcohol on a regular basis can increase your risk for developing many types of cancer. So beware of your consumption limit. Protect yourself from the sun - Apply generous amounts of sunscreen lotion before you go out. Also try avoiding the mid-day sun and wear protective clothing when outdoors to avoid the harmful effects of UV radiation. This can reduce the risk of skin cancer. Take early detection seriously - Regular self-exams and professional screening for various types of cancers such as those of the skin, colon, prostate, cervix, and breast can increase your chances of discovering it early, when treatment is most likely to be successful. 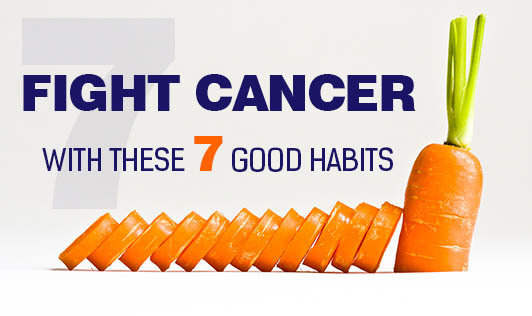 Note that these tips are plainly simple suggestions which are only intended to reduce cancer risk and not eliminate it.